Capitalizing off of capitalism has had a long and successful run in the U.S. It's an economic system that has served its citizenry for hundreds of years. However under the microscope of the current Occupy Movement, protesters have taken to the streets in dissent against the status quo, arguing that only 1 Percent really have control over a capitalistic society. While the OWS rank and file are growing exponentially, ironically there are just as many who would seize the opportunity to sell product based on its growing popularity. Today, if you were to visit commercial websites such as Zazzle or CafePress and search for "Occupy Wall Street" or "99 Percent" you would surface no less than 100s of products listed. Jay-ZAll while most of this un-copyrighted merchandise has been developed by individual "main-street" entrepreneurs looking to make a quick buck, this week controversy arose when music mogul Jay-Z took it upon himself to capitalize on the phenomenon. An early report indicated that the artist who is rich enough to travel in the 1 Percent stratosphere creatively changed up the slogan from "Occupy Wall Street" to "Occupy All Streets" to create a more universal appeal. 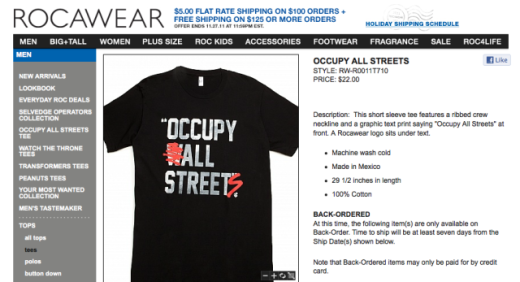 However, it was also noted he didn't plan to donate any of the proceeds from the sale of the shirts (priced at $22 each) to the Occupy Wall Street movement. Sold via the Rocawear website, fellow music artist Russell Simmons who owns the clothing label condones Jay-Z's actions, indicating "what's wrong with selling goodness?" 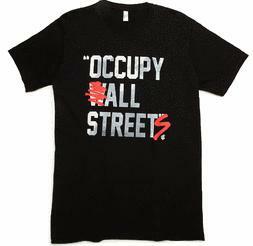 Question for my readers: Should someone of Jay-Z's stature capitalize on the Occupy movement for his own personal gain? Or should he donate a portion of the profits (if not 100%) to either the OWS group or one of one of the Occupy groups around the country? A local NYC songwriter known as "BwaySteve" recently released a protest song titled "99 Percenter." When asked if he was making money off any type of merchandise associated with the song, he said he would only consider that route if he could donate 99 percent of the funds to the cause, with the other 1 percent to help defray costs.